“Why, that’s over forty years ago!” The TARDIS, carrying the Doctor, Jamie and Victoria, narrowly avoids becoming engulfed in a mysterious cobweb-like substance in space. Arriving in the London Underground railway system, the Doctor soon discovers that something strange is afoot. The tunnels are being overrun by the army, the web fungus and the Great Intelligence’s robotic Yeti. With the help of their old friend Professor Travers, his daughter Anne, and their new ally Colonel Lethbridge-Stewart, can the Doctor, Jamie and Victoria find out who is in league with the Intelligence before its evil plan comes to fruition...? 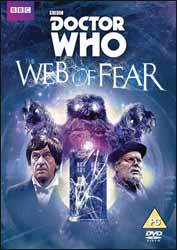 At last The Web of Fear comes to DVD – well, most of it anyway! Last year saw the recovery of nine 1967–8 episodes of Doctor Who that were previously thought to be lost forever. Phillip Morris of TIEA (Television International Enterprises Archives) found the film recordings of all but Episode 3 of Web and the whole of The Enemy of the World in a television relay station in Nigeria. Whereas Enemy did not previously have a great reputation compared with other Patrick Troughton stories, and thus came as a pleasant surprise to many watching it for the first time, Web has for years been widely hailed as a classic. How does it hold up today...? In a sense, there are surprisingly few recovered Troughton episodes on this DVD. The first part (of six) already existed in the BBC’s archive – though the copy found in Nigeria is of superior quality. In fact, all of the recovered and restored episodes on this disc look great. The second instalment features Troughton only in the recap from Episode 1, because the actor was on holiday that week. The missing Episode 3 is represented by a reconstruction comprising still images and the surviving soundtrack, and so it’s not until Episode 4 that we actually get to see any “new” Troughton action! It had been rumoured that the delay between the iTunes release and the DVD release of this serial was in order to allow time for the missing third episode to be animated – or perhaps even recovered in its original form. Sadly that is not the case, but really we fans ought to be grateful for a full-length reconstruction of any kind. Doctor Who is in a relatively fortunate position in that off-air soundtrack recordings exist for all of its missing episodes, thanks to the dedicated efforts of enthusiasts like Graham Strong. Many television series from around the same period are not nearly so well represented. That said, I do have some reservations about this reconstruction. I was already very familiar with the story, thanks to previous reconstructions and narrated soundtrack releases, so I could follow it, but I do wonder how clear certain actions, such as various characters’ exits and a Yeti responding to remote control, will be to the uninitiated watching this version. There is a single on-screen caption about 18 minutes in, which is rather odd in isolation. I think there should have been a few more, such as “Jamie and Evans run for the archway,” “Chorley leaves,” and “A Yeti comes to life and moves off down the tunnel.” Happily enough, this is a relatively talky episode, which comes across better in reconstructed form than the battles in the second, fourth and sixth instalments would have done had any of them remained missing. Writers Mervyn Haisman and Henry Lincoln keep us guessing as to who is in league with the Intelligence – far better than they did during the first Yeti serial, The Abominable Snowmen. They present us with a plethora of colourful and possibly suspicious characters, all of them well realised by the actors, including the crotchety Professor Travers (Jack Watling), the formidable Staff Sergeant Arnold (Jack Woolgar), the cowardly Driver Evans (Derek Pollitt) and the smarmy journalist Harold Chorley (Jon Rollason). The recovered episodes reveal details that could never have been deduced from surviving soundtracks and stills, including the fact that the Doctor pummels a Yeti when it attacks Captain Knight (Ralph Watson), how the Doctor disables a Yeti model using a vice, and the full horror of the possession that is revealed at the end of Episode 4: the man’s marionette-like arm movements, his sightless stare and the occasional glimpses of the terrified victim breaking through as he blinks. We can also see designer David Myerscough-Jones’s Underground sets (the accuracy of which reputedly managed to fool London Transport into thinking the BBC had filmed there without permission) in all their glory. Despite its classic reputation, The Web of Fear does have its weaknesses. We see the zippers on the Yeti’s backs – though to be fair, they are not supposed to be real creatures anyway. More seriously, there is some casual racism, in the form of the stereotypically avaricious Jew Julius Silverstein (Frederick Schrecker) and the Doctor using the word “Welsh” as an insult (“You blithering Welsh imbecile”). Victoria (Deborah Watling) is rather useless. She has a few feisty moments in the first couple of episodes, but other than that she achieves little except show her legs, scream and need rescuing. She becomes a downright liberty in Episode 3 when she tells Chorley about the TARDIS. Anne (Tina Packer) proves far more spirited and capable. Mind you, the Doctor also is unusually free and easy about the TARDIS’s secrets, describing its abilities to Knight and the surprisingly credulous Lethbridge-Stewart. Notably, the Colonel is far more open-minded about the TARDIS than he would be a few years later when working alongside the Third Doctor. I suppose it’s wishful thinking on his part in both cases. In this story the TARDIS could be his escape route, however “screwy” it may seem, whereas during the Jon Pertwee era that police box might have spirited away the Brigadier’s precious scientific adviser if it had been working properly. In common with the Enemy of the World DVD, the only special features on the Web of Fear disc are subtitles for the hard of hearing and a trailer for its fellow recovered story. I suppose you could count the reconstruction of Episode 3 as an extra, but it plays as part of the main feature. I would not be at all surprised if a special edition were to follow in a year or so, complete with audio commentary, documentaries and an animated Episode 3. This release will suffice for now, though.